Claw Toes is a condition suffered by many individuals, which is identified by the toes curling downward, and becoming painful. Anyone who has this condition, knows that not just any footwear will do. To alleviate the pain and help treat and prevent aggravation of this condition, a specific shoe type is necessary. Luckily many different types of shoes available offer exceptional features that will accommodate Claw toes and help treat this disorder. A Claw toe is basically a toe in which the middle and end joints have become contracted, causing your toe or toes to curl downwards. This in turn can lead to severe pressure and pain, particularly when the wrong footwear is worn. Claw toes are classified according to mobility, there are Rigid Claw toes, that cannot move, and Flexible Claw Toes, which are mobile in the joints. Claw Toes are the result of an imbalance in your muscles, which in turn causes the ligaments and tendons to become abnormally tightened, resulting in the joints curling downwards. Arthritis is one of the main causes of Claw toes. 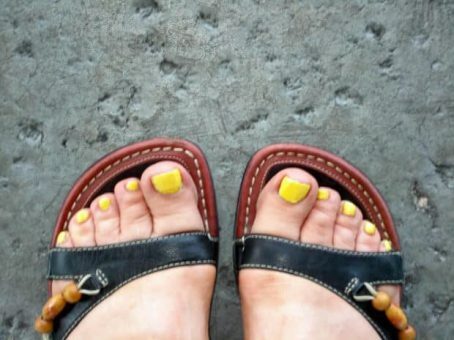 When it comes to treating Claw toes, changing your shoes regularly will most definitely help. Then you also need to look for a shoe with a HIGH and BROAD toe box, as well as features that prevent friction. Gel toe shields can aid in eliminating friction as well as providing comfort and lubrication. Most orthopedic shoes are designed with extra depth and height, which is ideal for foot conditions such as Claw Toe, hammer toe and Bunions. Orthotic insoles likewise provide proper support and comfort, which helps to prevent pain and the progression of the deformity. Many athletic shoes similarly have features like these to provide comfort and support for this condition, as well as being ideal to use for walking and performing activities. When it comes to Claw Toes a gel or supportive toe cap, and a broad and roomy toe box are most important to help alleviate pressure and reduce friction. So finally the Shoe Types, I would recommend for Claw Toes are, Athletic Shoes, Orthopedic Shoes, and Bio-mechanical Shoe Types. Wide and Roomy Toe Box. Gel Forefoot or Toe Area. Cushioning, such as EVA, Gel or Foam. The Asics Gecko is an excellent outdoor running and walking shoe with both a high and wide toe box, as well as flexible upper construction which is perfect for individuals with Claw Toes or similar foot conditions. Flexible and highly breathable upper construction from Mesh and Synthetic overlays. There are rubber bumpers that extend from the sole to the heel and front of the foot for ideal durability and added protection. A comfortable lace-up system to allow you the best fit possible. Offers excellent shock absorbency and cushioning particularly for running and walking. Features a high and wide toe box for less pressure, on our toes and forefeet, with good forefoot cushioning. An outdoor trail pattern and lug rubber outsole for challenging trails. A low top arch and padded heel collar that protects your ankles and ensures excellent heel stability. Available in some vibrant and colorful design options that are aimed specifically at ladies. Maybe not the most aesthetically appealing shoe, although it does hold a classic elegance to it, the Dansko Clog, in this case the Sanita from the professional range is the perfect work shoe. Most of the Dansko shoe models feature a high and wide toe box for foot deformities and conditions such as Claw Toes, the Professional range features some more features for comfort and support. I have chosen the Sanita for its elegant appeal and many dark and rich color shade options. Manufactured from 100% genuine supple and comfortable leather. A classic clog style available in a few color options for you to choose from. The toe box is wide and high offering ample toe room, with contrasting piping at the top line and full welt stitch construction. The insole is padded for comfort with an inclined forefoot for better balance and stability. An anatomically shaped footbed that cradles and supports your foot fully. Excellent shock absorbency and cushioning. The PU outsole is sturdy, comfortable and slips resistant. The Clarks Delana Venna is a stylish and comfortable Platform sandal that is a bit more formal and elegant for wearing to special occasions. The soft and supple leather straps will not place pressure on your toes and the ample cushioning offers superb comfort and support. 100% durable and supple leather upper construction. Soft leather straps on the uppers with decorative flower embellishment, available in a few stunning color options. The outsole is made from flexible rubber that offers good grip on most surfaces and is extremely durable. The insole features cushioned technology that cradles the foot for superior comfort and support. Likewise boasts a wide and roomy toe box are. An excellent choice in walking shoe with some stunning designs and color options available that will look good with almost any casual outfit. The Ryka devotion Plus features a wide and high toe box, with flexible upper construction for less pressure on painful toes and metatarsal area. The uppers are manufactured from soft and flexible breathable mesh, with synthetic overlays that offer good support. The anatomical precise return footbed ensures excellent shock absorbency, comfort and energy return. A lightweight molded EVA outsole with a full re-zorb platform and external POD network in between the midsole and outsole. There is a full-length internal insert for full support and cushioning. The eight-piece radial rubber skeleton works along with the re-zorb midsole and cobblestone engineering for the ideal walking shoe. A durable and high traction outsole. The toe box is wide and high for ample toe and forefoot room. Large color and design pattern assortment of neutral and funky, as well as vibrant color and pattern options available. Don’t we all love a stylish Western Style boot, but unfortunately when it comes to foot conditions such as Bunions and Claw Toes, most Western Style boots have a Toe box that is way, to small and narrow. Luckily not the Fatbaby from the Ariat Western Heritage range, this cute little boot is quite the opposite, with a wide fit and very roomy toe box, it is quite perfect. 100% Durable leather upper construction with fabulous decorative stitching in gorgeous color threading. An 8-inch shaft for a bit of extra height in a cowboy boot style. Inside there is a breathable mesh lining to keep your feet dry and comfortable. The Ariat Pro Crepe outsole ensure a sleek and attractive profile. There is likewise 4LR footed support and cushioning for comfort and shock absorbency. A slight heel for a bit of sophistication. Available in a few colors and design options for your perusal. Features a wider fit and a very roomy toe box. Very uniqe and innovative approach for correcting toe claws. Comfortable and special padded toe separators. Molded footbed and heel cup for better arch support.